* Basis for feature documentary and special edition of US News & World Report Unravel the Secrets of The Da Vinci Code Movie and Book! Secrets of the Code is a sweeping tour, guided by renowned experts, that will help you separate fact from fiction, satisfy your curiosity and engage your imagination. It is the ultimate guidebook for exploring The Da Vinci Code phenomenon and the perfect starting point for finding your own answers. The Mysteries Surrounding the Sequel to "The Da Vinci Code"
Secrets of the Widow's Son is an unprecedented book concept: Relying on extensive investigative reporting and intellectual sleuthing, it is an explorer's field guide to understanding the main themes, ideas, symbols, and historical issues that author Dan Brown will likely utilize in The Solomon Key—many months before this much-awaited sequel to The Da Vinci Code is even published. Months of research, dozens of books, hundreds of Web searches, and some 5,000 pages of documented history and legend led Shugarts to understand the role of the “Widow’s Son” in the history of Freemasonry, biblical apocrypha, Mormonism, and various secret societies and occult belief systems. This led to the prediction that the Masons would be central to Dan Brown’s next book, that the action would be centered in Washington, DC, and that the plot would undoubtedly have much to do with the important (but surprisingly little-known and little discussed) Masonic influences in the American Revolution. For example, many of the founding fathers of the United States, including George Washington, Benjamin Franklin, and Paul Revere—and nine signers of the Declaration of Independence—were Freemasons. Washington, DC is a playground for anyone looking for Masonic symbology: the Egyptian obelisk-like Washington Monument, with its controversial history involving the Masons and the Catholic Church, the unfinished pyramid and all-seeing eye on the dollar bill, the alleged secret Masonic grid on which the streets and monuments are laid out, etc. Shortly after one of our press releases, Dan Brown himself confirmed that his next book would indeed be about the Masons, and that his symbologist-protagonist, Robert Langdon, of Da Vinci Code and Angels & Demons fame, would be back to lead his readers on a symbolic treasure hunt through the art, architecture, and secret codes of our nation’s capital. More recently, Dan Brown’s publisher leaked the title: The Solomon Key. Like Widow’s Son, this is another highly charged phrase, loaded with rich Masonic allusions, legend, and lore. So we believe we are on the right track in our hunt to understand the ideas and themes of The Solomon Key before the novel is even published. Let’s be clear: Dave Shugarts' book is not designed to be a plot spoiler for The Solomon Key. He is not trying to guess who will be murdered, or which fictional mysteries, cover-ups, and conspiracies will be invented to drive the plot of this story, or how Langdon and Sophie Neveu (or the next in his series of beautiful, brainy crime-solving partners, if it isn’t Sophie) will decode the codes and symbols and figure it all out. Instead, Secrets of the Widow’s Son is about the ideas and issues that will form the background and context for The Solomon Key. Is Washington DC simply an architect’s dream come to life or a purposeful grid linked to the occult? The strange history of the Washington Monument, and how stones keep disappearing there…The National Gallery and its Masonic connections. Secrets of the Widow’s Son is an unprecedented publishing event: a book about a book that has yet to be published. As the world waits breathlessly for Dan Brown to publish his sequel to The Da Vinci Code, this new book, Secrets of the Widow’s Son, prepares international audiences for what they will experience in Brown’s forthcoming book. 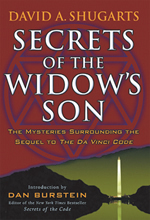 Instead of asking what is fact and what is fiction after reading Brown’s next book (as so many readers all over the world did in the case of The Da Vinci Code), those who read Secrets of the Widow’s Son will have the unique opportunity to explore these questions in advance. For information about the author, click here.